Now, you can secure this 2015 Silver Eagle Four-Coin Proof Set, with each coin graded perfect Proof-70 Deep Cameo (PR70 DCAM) First Strike® (FS) by Professional Coin Grading Service (PCGS). The four coins are also First Day of Issue releases from the Philadelphia Mint, the Denver Mint, the Washington D.C. Gift Shop and the Florida F.U.N show. Each label is hand-signed by John Mercanti and sealed with the coins in their respective PCGS holders. 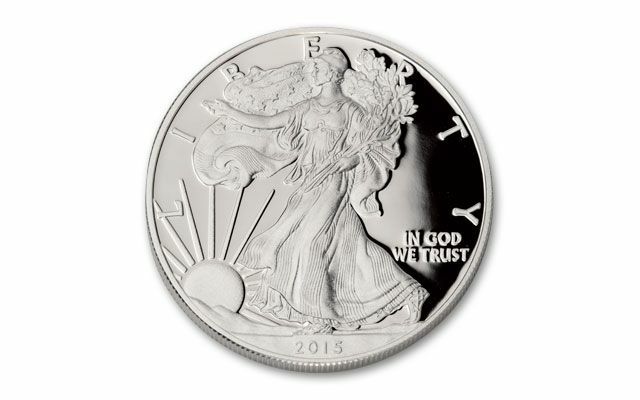 Each 2015 Silver Eagle Proof is struck at the West Point Mint and includes a "W" mintmark. 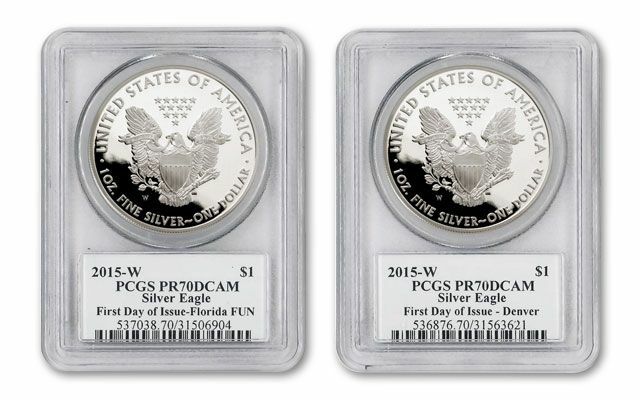 Each coin is graded by PCGS to be in PR70DCAM condition. Each PCGS label states "1st Day of Issue" with the Mint or site it was purchased at; the options include Philadelphia, Denver, Washington D.C., and Orlando FUN Show on the label. Each coin is a First Strike and features the authenticate signature of the 12th Chief Engraver John Mercanti. Since 1792, there have ONLY been 12 official and prominent Chief Engravers of the U.S. Mint. This prestigious position is highly important as the Chief Engraver oversees the production of all coinage for circulation and for collectors. 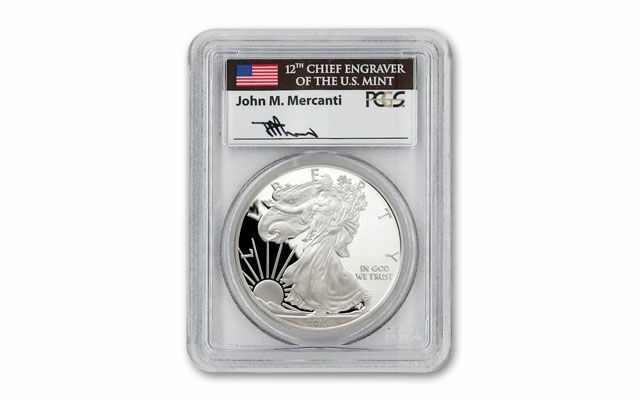 Mercanti was the Chief Engraver from 2006 to 2010 but started at the Mint in 1974. John Mercanti has produced more coin and medal designs than any employee in United States Mint history (dating back to 1792). 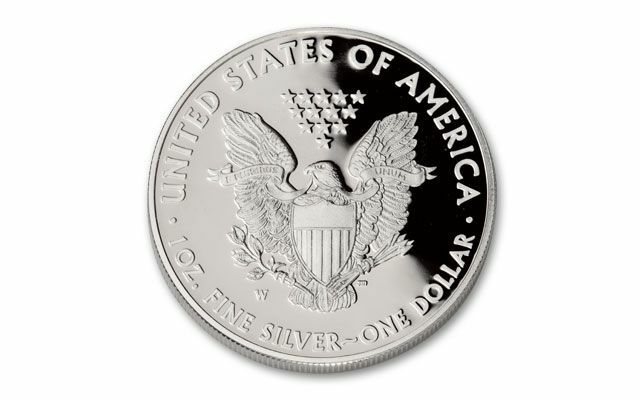 He designed the reverse of the Silver Eagle and the obverse of the Platinum Eagle that has been struck in proof condition annually since 1997. He designed quite a few modern gold and silver commemoratives in addition to five states in the States Quarter Program. As a testament to his legacy at the U.S. Mint, each NGC coin label prominently features his hand-signed signature. 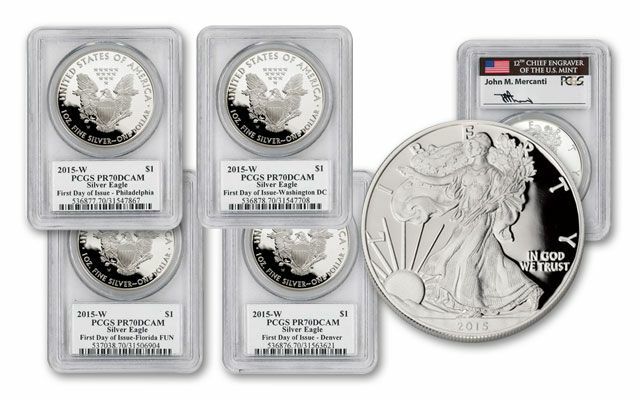 We are the exclusive distributor of all PCGS 2015 $1 1-oz Silver Eagle Proofs graded in PR70DCAM with the 1st Day of Issue and Location of Purchase designation, and the Mercanti signature. That's a lot of "bells and whistles." Based on the PCGS Population report, only 1,655 of this set could ever be assembled. We only have a few left. Once they are gone, they are gone forever. Order now to avoid disappointment!